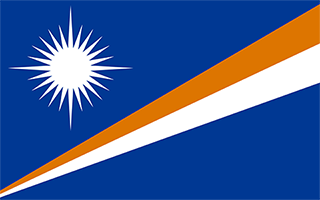 Marshall Islands with its capital Majuro is located in Oceania (Oceania, two archipelagic island chains of 29 atolls). It covers some 182 square kilometers (about the size of Washington, DC) with 74,539 citizens. Marshallese and English are the common languages used in Marshall Islands. Thiscountry has no land-based border with any other country. The Marshall Islands are a group of atolls and reefs in the Pacific Ocean, about half-way between Hawaii and Australia. The Marshall Islands consist of two island chains of 30 atolls and 1,152 islands, of low coral limestone and sand. Bikini and Enewetak are former US nuclear test sites; Kwajalein, the famous World War II battleground, is now used as a US missile test range. The topography is low coral limestone and sand islands. The average density of population is about 412 per km². The climate in Marshall Islands can be described as tropicalhot and humid, wet season May to November, islands border typhoon belt. Potential natural disasters are infrequent typhoons. To reach someone Marshall Islands dial +692 prior to a number. The local cellular networks are operated on 900 MHz, 1800 MHz. Websites typically end with the top level domain ".mh". If you want to bring electric appliances (e.g. battery chaarger), keep in min the local 120 V - 60 Hz (plugs: A, B). The sign for the locally used currency Dollar is USD. Blue with two stripes radiating from the lower hoist-side corner - orange (top) and white; a white star with four large rays and 20 small rays appears on the hoist side above the two stripes; blue represents the Pacific Ocean, the orange stripe signifies the Ralik Chain or sunset and courage, while the white stripe signifies the Ratak Chain or sunrise and peace; the star symbolizes the cross of Christianity, each of the 24 rays designates one of the electoral districts in the country and the four larger rays highlight the principal cultural centers of Majuro, Jaluit, Wotje, and Ebeye; the rising diagonal band can also be interpreted as representing the equator, with the star showing the archipelago's position just to the north.